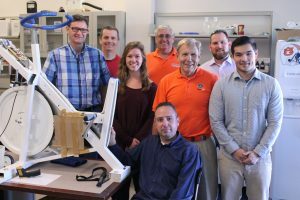 Pictured from left to right are Dr. Bruce Gladden, Dr. Gustavo Mota (Federal University of Triangulo Mineiro, Brazil), undergraduate student Julia Kimbrough, Dr. David Pascoe, Dr. Jim McDonald, Dr. Jeff Martin (VCOM), doctoral student Zack Rightmire; seated is Dr. Andreas Kavazis. Gustavo Ribeiro da Mota, Ph.D., a visiting Fulbright Scholar from the Federal University of Triangulo Mineiro in Brazil, recently collaborated with Bruce Gladden, Ph.D., director of the Muscle Physiology Lab in the School of Kinesiology, on research investigating the impact of blood flow restriction and ischemia-reperfusion on performance. This past Fall, Mota and Gladden studied the potential for this intervention to improve performance. Mota and Gladden’s research investigated the use of ischemic preconditioning (blood flow restriction) before exercise. With occlusion (blood flow restriction), and then hyperemia, or extra blood flow, more oxygen may be delivered to the muscle. However, the specific mechanisms and ensuing effects of this are unclear. Some studies have shown an increased oxygen uptake by muscle cells. Mota and Gladden are aiming to determine if this blood flow restriction intervention prior to exercise has a positive effect on performance. The novelty here was using an arm exercise instead of the typical leg exercise, and using female subjects instead of males. In previous studies, only 15 percent of the participants were female. Female subjects performed a three-minute, all-out test on an arm ergometer shortly after wearing a cuff on the upper arm to alternately restrict and release blood flow over a period of three, 5-minute cycles (3 minutes occluded, 2 minutes deflated). During both the ischemic preconditioning phase and the power output test, the subjects wore NIRS optodes for near infrared spectrometry on one arm to measure muscle oxygenation/deoxygenation responses. The researchers also measured peak and average blood flow during the ischemic preconditioning maneuver, and used a fatigue index to determine how much the subject’s power output declined during the arm cycling test. There were two conditions: one in which the cuff actually restricted blood flow, and one in which the cuff was only partially inflated and did not restrict blood flow. The study employed a randomized crossover design, so every subject performed both conditions. However, nothing was said to the subjects before either condition in order to minimize or avoid a placebo effect. After the protocols were complete, the researchers asked the subjects individually if they noticed a difference of pressure with the cuff. All of the subjects said yes. Then they asked the subjects what they expected in terms of performance. Interestingly, half said they expected a decrease in performance when they had the occlusion, meaning they perceived the blood flow restriction would have a negative effect on their performance. The other half said they expected no effect or even a positive effect on their performance from the occlusion. With the sham condition (no occlusion), most said they expected no effect on performance. The actual blood flow, near infrared, and performance data are currently being analyzed. Other Auburn University researchers involved in the project were Drs. Jim McDonald, Dave Pascoe, and Andreas Kavazis of the School of Kinesiology; Dr. Jeff Martin of VCOM-Auburn, Kinesiology doctoral student Zachary Rightmire, and Kinesiology undergraduate student Julia Kimbrough. Mota graduated from Sao Paulo State University with his Ph.D. in 2007, and is now an Associate Professor at the Federal University of Triangulo Mineiro in Uberaba, Minas Gerais, Brazil. After his four month sabbatical at Auburn, Mota headed to Lausanne, Switzerland for three months to conduct further research on hypoxia (low oxygen), this time during exercise at altitude with Dr. Gregoire Millet, an exercise and altitude expert.